Brown ground turkey, onion and 1/2 teaspoon oregano in a large skillet. Cook thoroughly and drain. Add spaghetti sauce, water and mushrooms. Simmer approximately 5 to 7 minutes. In another bowl, combine Ricotta cheese, parsley, oregano, egg, and about 3/4 cup Parmesan cheese. 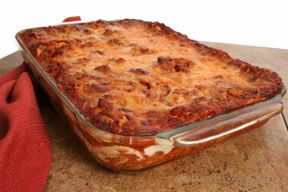 Spread 1 1/4 cup spaghetti sauce on the bottom of prepared baking dish. 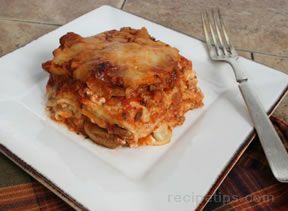 Layer uncooked lasagna noodles on top of the sauce. 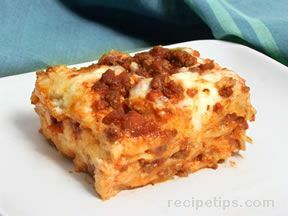 Layer with half of the Ricotta cheese mixture and sprinkle with half of the grated cheese. Repeat spaghetti sauce, noodle, and Ricotta cheese layers. 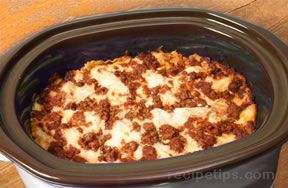 End with a layer of spaghetti sauce and sprinkle with 1/4 cup of Parmesan cheese. Cover and refrigerate overnight or a minimum of 8 hours. Bake in preheated oven at 350° F for approximately 50 to 60 minutes. Let stand approximately 15 minutes before serving.